MWN Blog: Monday afternoon severe weather update - what's next? Monday afternoon severe weather update - what's next? An early morning line of storms swept through with little fanfare, at least regarding severity, though there was some pretty decent thunder with it. Around noon, another line of storms moved through the metro area, prompting Severe Thunderstorm and Tornado Warnings. There were a couple of "sighted" tornadoes and funnels, though no damage from tornadoes has been confirmed. In the wake of these storms, watches have been cancelled and the sun is beginning to come back out. For the rest of the day and night, the metro counties remain under a MODERATE RISK of severe weather (see maps at bottom). Expect a few thunderstorms this evening once the atmosphere "re-energizes" following the mid-day storms. Some of these storms could be strong to severe. Then, the next major round of weather will likely be in the form of another squall line, though probably stronger and certainly cover a larger area than the mid-day storms. It too will be severe with the threat of large hail, damaging wind, and tornadoes. In addition, torrential rain will lead to some flash flooding. I expect a Tornado Watch to be issued by this evening, with the line moving through the metro area between 10pm and midnight (in fact, a Tornado Watch for central and northern AR is forthcoming as I type). Steady, perhaps heavy, rain will last for a few hours behind the line, or into the early morning hours. The timing of the line could be about the same time as the FedExForum will empty tonight, following a Grizzles victory over the Spurs. Following tonight's line, it should be a little quieter through much of the morning and possibly early afternoon Tuesday before scattered supercell storms fire late Tuesday afternoon ahead of a developing surface low pressure system to our west. This low will have the greatest impact on our weather Tuesday night into early Wednesday, when the threat of severe storms will be maximized with the possibility of tornadoes, some of which could be long-lived and strong. This is still a developing situation and we'll have more on this threat during the day tomorrow. The other threat that must be mentioned is that of flooding. The possibility of major flash flooding, urban flooding, and river flooding cannot be understated. By Wednesday afternoon, some places in the metro area may receive up to 8-12" of total rainfall. Creeks, streams, drainage ditches, low-lying areas, underpasses... all of these will become danger zones and could (hopefully not) take someone's life. Besides preparing for severe weather, also be prepared for the possibility of flooding. Some areas could see flooding that rivals May 1-2 last year! 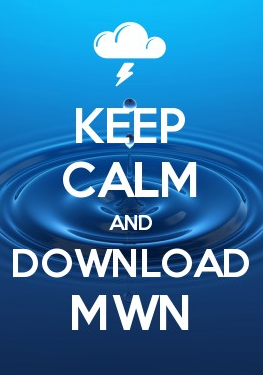 A complete set of safety tips for severe weather, tornadoes, and flooding, can be found at the bottom of the MWN Storm Center page and you can sign up to receive severe weather warnings by e-mail on our Severe Weather Notification page.